-Both work, I just upgraded mine so these need a good home. -Selling them as a set, may consider an offer on the stove by itself but not the fridge alone. She also found this ad for Frigidaire appliances from 1972. 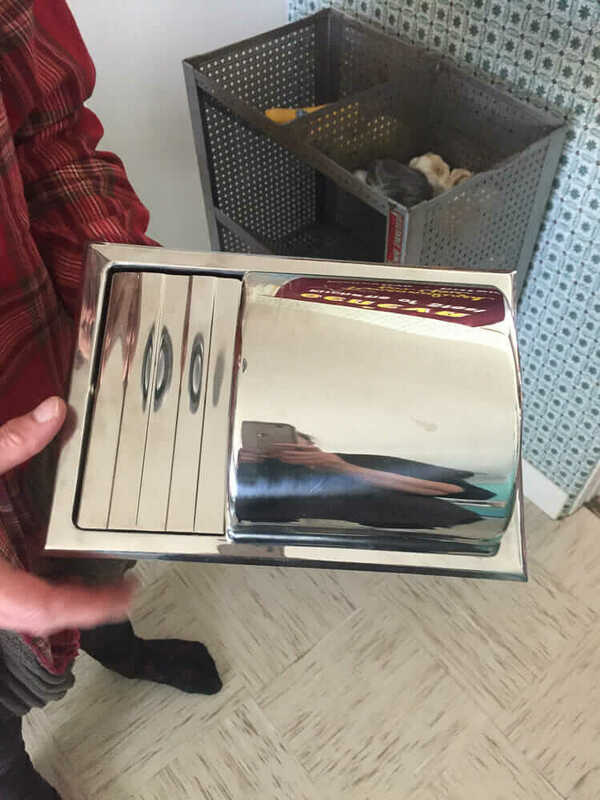 This stove cost $289 in 1972. The refrigerator was $369. I think that’s way more money, adjusted for inflation, than we pay for appliance today. Come on, someone must neeeeeeeed these! 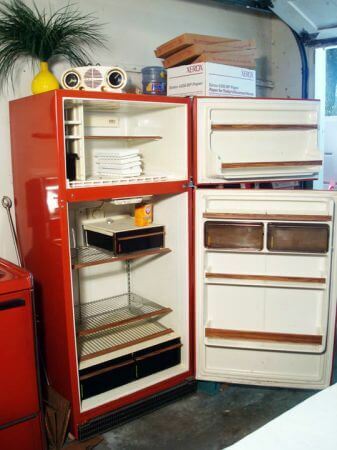 Update: Thanks to some keen eyes, reader Janet in CT spotted another rare red appliance — this 1960s red GE range, listed for sale on the Pensacola, Florida Craigslist. Vintage 1960’s Range. Original paint (RED), push button setting,very clean in good condition. Wow, what a beauty. 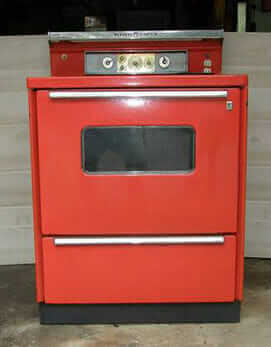 Mega thanks to the Craiglist seller for allowing us to archive their photos of this retro-licious red stove. 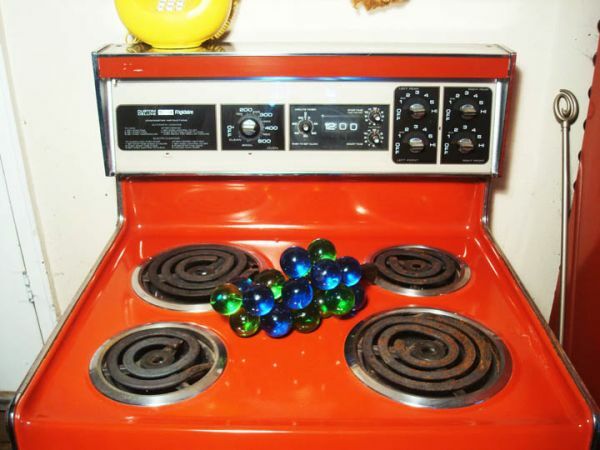 According to the seller, there are already several interested parties and they think the stove will be sold before the week is through. 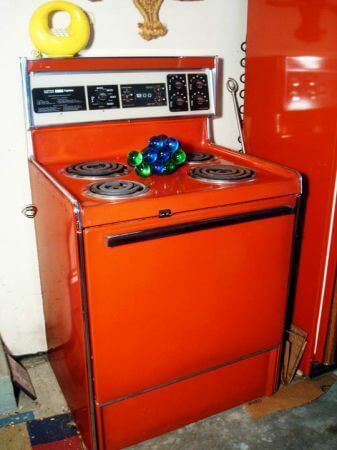 Do you want kitchen appliances in a color or with retro style? See all my Appliances research here. 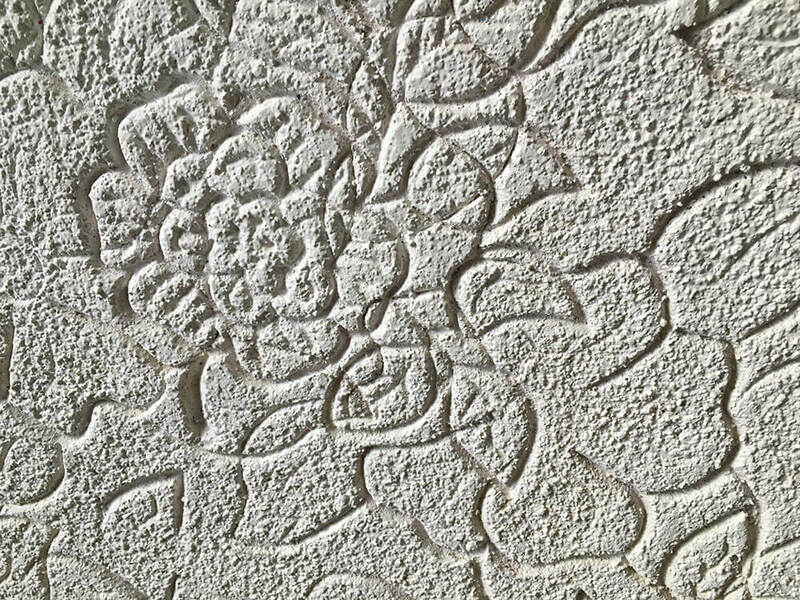 Tamara’s embossed ceiling from the 1960s — have you seen this before? 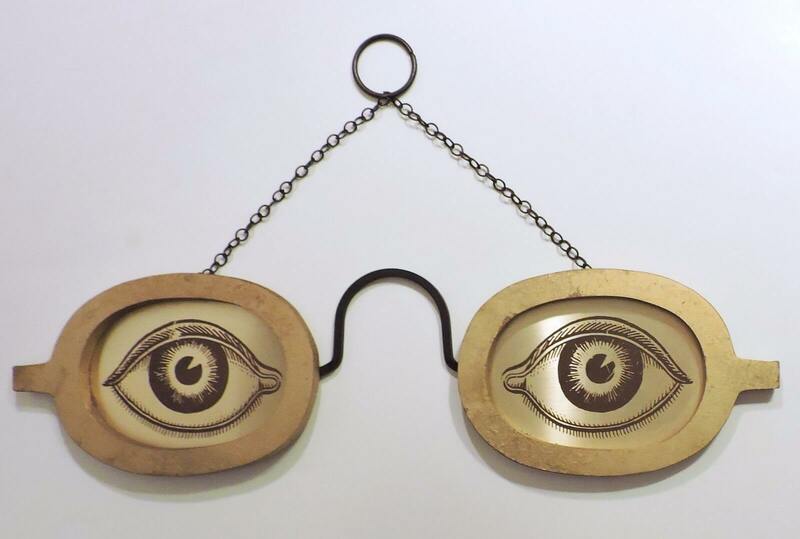 Vintage Masketeers optical sign eyeglasses wall hanging — great graphic appeal! Pretty neat! Take note of the radio, telephone and glass grapes. There’s alota retro going on in this picture. retro, if someone wants to re-live the mid seventies, but not mid century. I’m covering the 70s too! Even the 80s every now and then! THANK YOU for covering the 70’s. I like the looks just as much as the 50’s and 60’s!! My son was born in 1970 and he is really into the 70s. I float between space age 50s, hippie 60s and way out 70s. They all work together if you squint just right. I just scored me a 1970s Ethan Allen cogwheel coffee table that I coveted when I was setting up my first house and couldn’t afford! I love it! Wonder why that faded away while Harvest Gold took off? I’ve never liked the gold color, but the red is just beautiful. 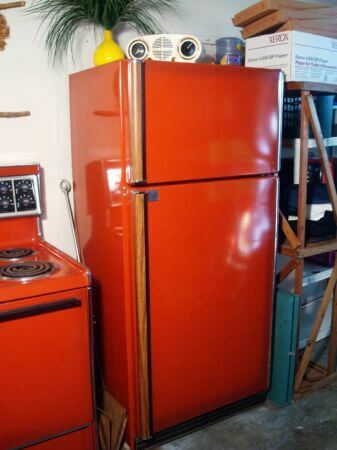 And really, any color in appliances is pretty nice. 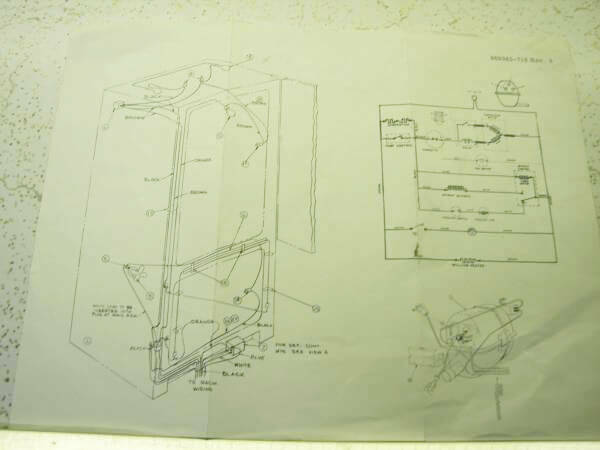 I was just trying to convince myself that the red Bertazzoni stove would be worth its price. 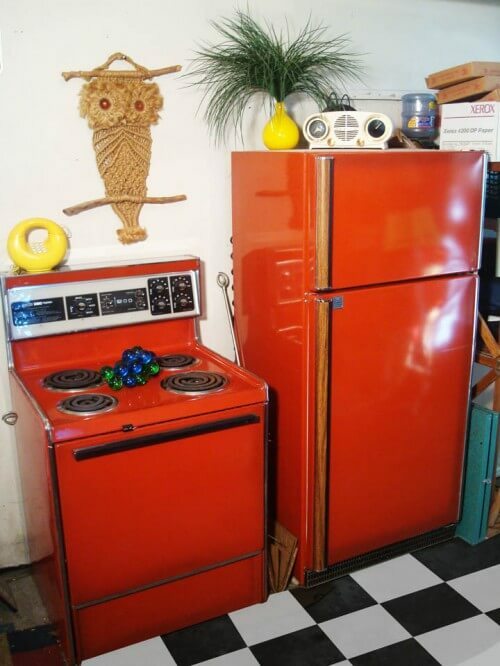 Love the red stove and frig. Would love to add some color in my kitchen with these.